Made by Websdale, Shoosmith Ltd in Sydney, New South Wales, Australia, 1960-1969. 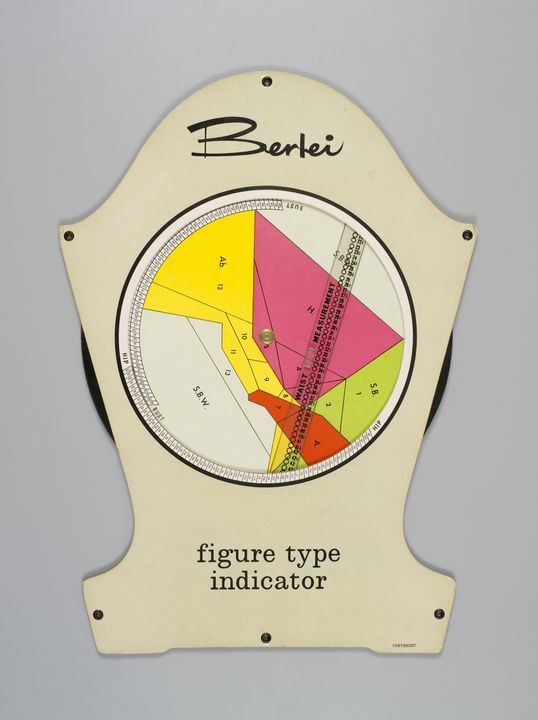 Australian version of the Berlei Figure Type Indicator produced during the 1960s and designated as "Indicator G". The chart was designed to be hung on a wall of a corsetiere and approximated the shape of the female torso. It was green/grey in colour with black text which reads, "Berlei/figure type/indicator". It enabled a fitter to determine the client's precise bust, waist and hip measurements so that she could be fitted with a foundation garment. The chart featured a moveable disc for indicating bust measurement and a moveable pointer for waist measurement. Hip measurement sizes were printed on the border surrounding the moveable disc. An instruction sheet with illustrations has been printed on the back of the chart. The five Berlei figure types on the moveable disc in this version are colour coded: pink (Hip), green (Sway Back) , red (Average), yellow (Abdomen) and grey (Short Below Waist)". The chart was printed by the Sydney firm of Websdale, Shoosmith Ltd. It is the same version of the indicator as P3645-28/20. The number "10" has been stamped on the back of the item at the top. The firm of printers, Websdale, Shoosmith Ltd was located in Sydney, New South Wales, Australia.